Arjun and I have been married for almost eleven years. And for the majority of that time I have been on the hunt for a good cookbook that features recipes from West Bengal – the Indian state from which Arjun and his family hail. And along the way Arjun and I have bought a few misses. 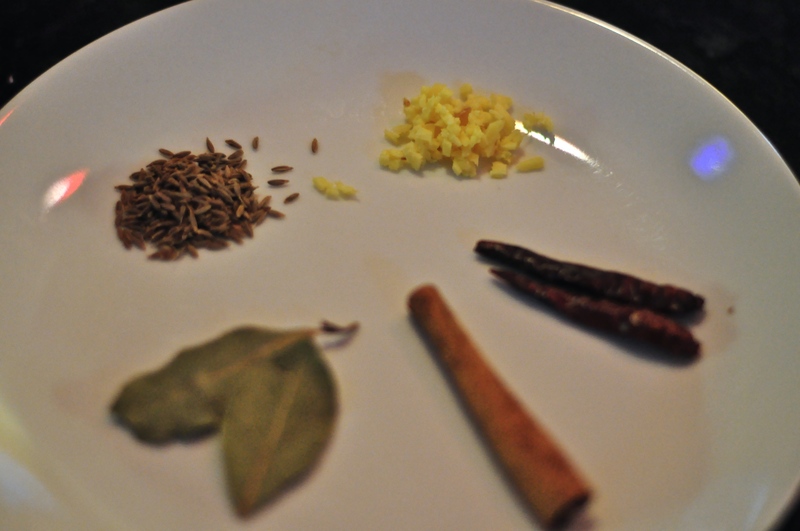 I had honestly just about given hope that there were any Bengali cookbooks written for the likes of me – someone who doesn’t have the basic knowledge of a Bengali kitchen and was raised outside of India. So imagine my surprise, when browsing at a bookstore in Kolkata on our last trip, I came across a book based on a blog written in the US called Bong Mom’s Cookbook. This lovely book and also blog is written by the talented Sandeepa Mukherjee Datta. Sandeepa recalls foods from her childhood in West Bengal beautifully and lyrically. Her recipes are always woven with stories of her childhood or her present – busy with two kids of her own that she is trying to expose to her family’s native cuisine. She is candid and funny and just a delight to read. I started leafing through her book in Kolkata and couldn’t wait to bring it home and give some of her recipes a whirl in my kitchen. One dish that stole my fancy on our trip was a yellow lentil stew with cauliflower and peas. 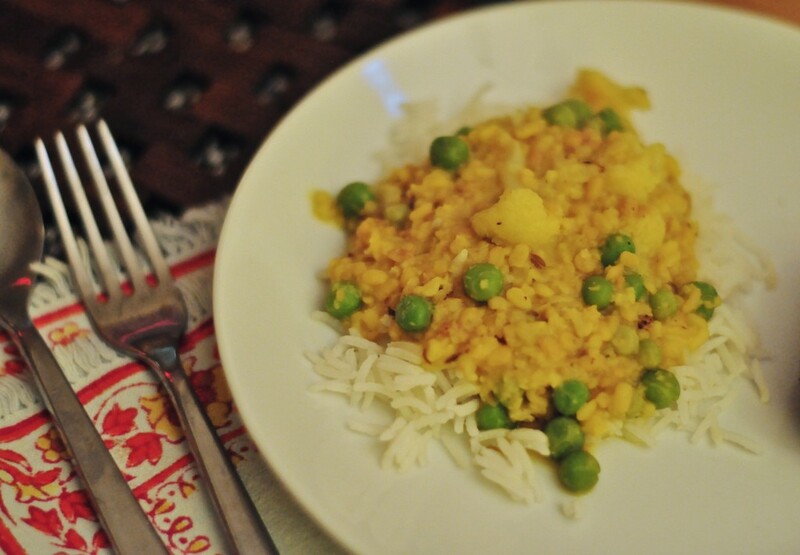 Small, bright moong lentils are used and the stew is simply spiced and incredibly comforting. I loved that there were veggies in the stew both for the variation in texture and flavor plus making this a one-pot meal. When I saw that the Bong Mom’s Cookbook had a recipe for this dish I knew that was the first one I was going to try. Sandeepa calls to make the stew with shrimp or peas. I opted for peas since I was already serving fish with the meal. I also increased the amount of vegetables from her recipe so it would feel heartier and play the part of vegetable and lentil at my table. I’m happy to report that it turned out beautifully and tasted just like what we had at relative’s homes in Kolkata. I served it with basmati rice and the fish croquettes I blogged about recently. Arjun took one taste and looked amazed – he said that taste transported him to the meals of his childhood. I can’t think of a better endorsement (or compliment) than that! Try it for your very own Kolkata taste at home. 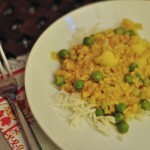 A comforting, thick stew of yellow lentils studded with cauliflower and peas. Recipe loosely adapted from Bong Mom's Cookbook. Dry roast the moong lentils for 5-6 minutes at medium heat. A cast iron skillet works beautifully. As soon as 50% of the lentils have turned brown, switch off the stove. The lentils will have a nice, nutty aroma. Put the lentils in a dutch oven with 4 1/2 cups of water and the turmeric. Bring the contents of the pot to a boil and then reduce to a simmer. Cook for 30-40 minutes until the lentils are tender. Heat 1 tsp oil in a large skillet over medium heat. 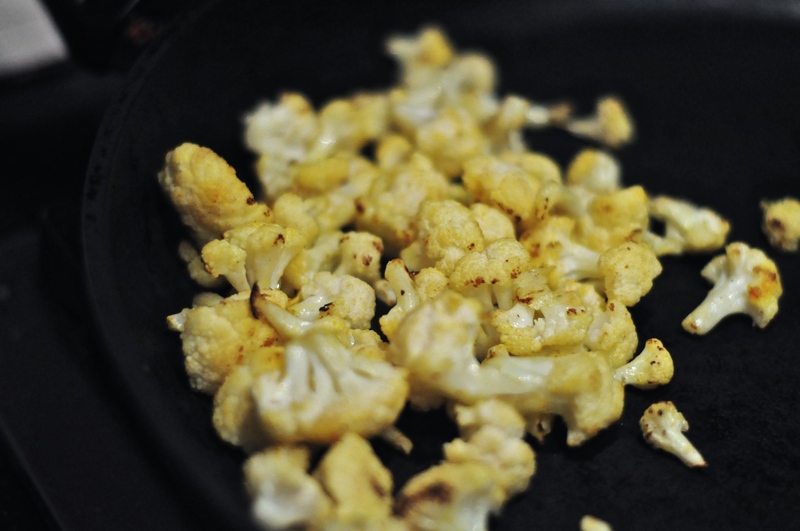 When hot, add the cauliflower florets with a pinch of turmeric. Cook until they get little brown spots, then remove and set aside. In the same skillet, heat the remaining 2 tsps oil and 1/2 tsp ghee in a skillet. When the hot, add the whole spices for tempering. After the spices have release their aroma - about a minute - add the ginger and saute for 30 seconds. Add the lentils to the skillet (leaving any water behind if all was not absorbed) and fry for 2-3 minutes. Return the lentils to the saucepan and add 2 cups of water and salt. bring the lentils to a boil and add the cauliflower and peas. Cook until the cauliflower is just tender 5-6 minutes. 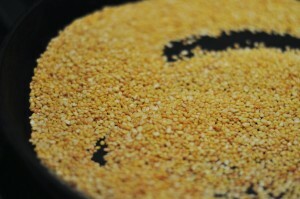 Stir in the remaining 1/2 tsp of ghee and let lentils sit for 10 minutes for flavors to meld before serving. **You can find moong lentils at your local Indian markets or online. Ghee is simply butter that has had the milk solids removed. It is shelf stable and sold at grocery stores like Trader Joe's or Whole Foods. You can also find it at Indian markets or online. This sounds so perfect to battle the cold of NYC! I don’t like mong dal but prepared this way is really good and it is a one pot meal I don’t have to cook vegetable. I really enjoyed making it. I’m so glad you enjoyed it! Hopefully it will convert others that may not love Moong dal as well.